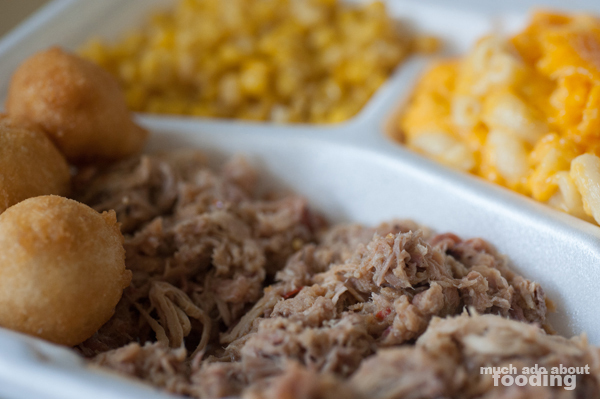 You can't go to North Carolina without getting some good ol' southern BBQ, specifically Carolina pulled pork. It would be a tragedy really. 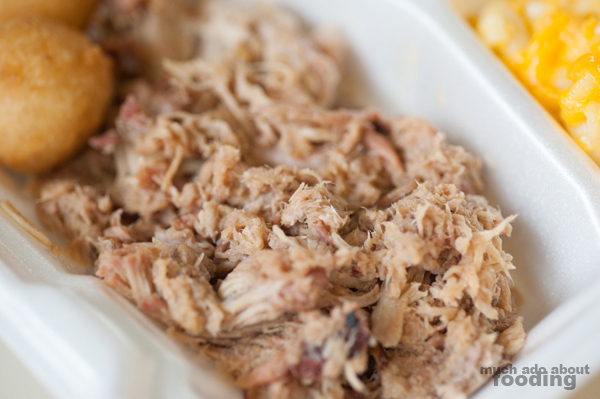 When we visited Durham back in October, I knew that Duc had to be exposed to Carolina pulled pork so one day while we were driving around neighborhoods, we looked up nearby places that did it well. Backyard BBQ Pit came up, and we were really drawn to its old school cafeteria-like arrangement. Sometimes those holes-in-the-wall are the best places to find the best foods! The verdict? Fantastic. 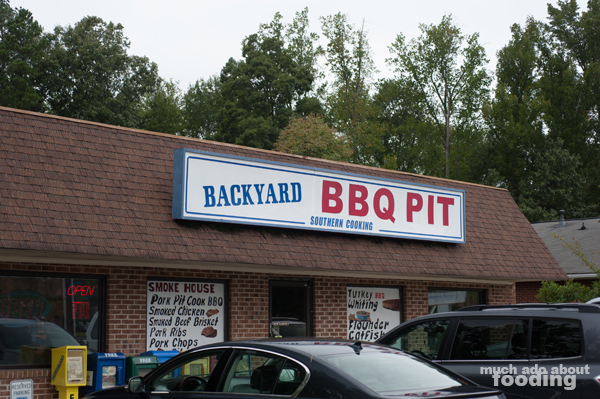 Backyard BBQ Pit is set up very simply with a straightforward menu that involves picking your BBQ and accompanying sides. All items are in metal pans kept warm underneath and sloshed into your styrofoam trays/plates as you order. You can buy your meals to eat here (served on plastic trays) or to-go and if you're feeling like whipping up meals with your accompaniments, there are options to buy the meats by weight. We also spotted catering options for those wanting a good ol' buffet of Southern cooking. In particular, I knew we had to have their Carolina pulled pork. For starters, all trays come with a handful of puffy hush puppies that were a bit lighter than the hush puppies I'm used to. Instead of dense cornbread, these were airy and slightly dry. 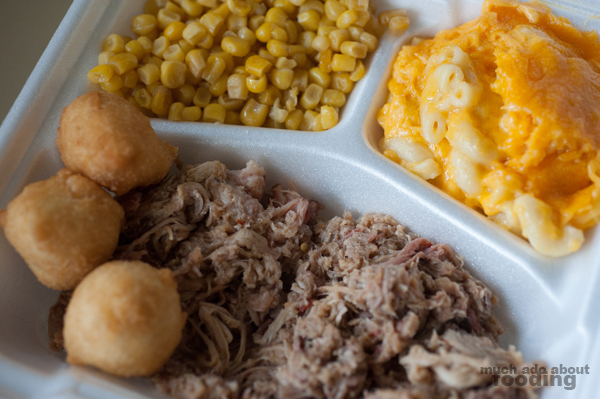 Duc opted for their pulled pork tray ($7.49) with sides of sweet corn and mac 'n' cheese. I think it'd be accurate to claim that the corn was not fresh sliced up there (frozen/canned perhaps) but it still hit the spot when mixed in with the other pieces. Their mac was mushily incorporated with an excess of neon melted cheese for a heart attack-inducing mess that satisfies the need for indulgence. As for the pork, the signature vinegary kick of Carolina pulled pork with a hint of heat was there in all its glory; tender and moist, the pork was practically perfect. 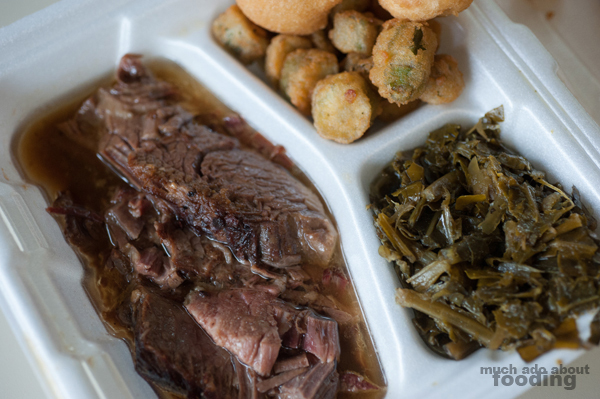 My tray of beef brisket ($11.49) was joined by fried okra and collard greens, both very traditional Southern sides. The beef was melt-in-your-mouth soft, evidence of the hours put into slow smoking the meat. I liked that the fried okra was still light though fried, and the collard greens gave me a swift kick in the mouth with some spice to it. Overall, I'd say this was a fine place to stop in for a quick service order of delicious Carolina BBQ made right.